High School bass fishing photo courtesy of Fishing League Worldwide and Protect the Harvest. What if I told you there's one sport in particular that enjoys a healthy dose of competitors and is an activity enjoyed by 9.6% (33.1 out of 317 million) of the entire U.S. population, yet a majority of Americans don't even know that it exists on the high school level? 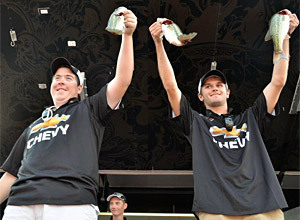 The sport is competitive fishing, and it's growing rapidly among amateurs. The Student Angler Federation (SAF), which is a division of The Bass Federation, has programs in place for students and their high schools to sign up and participate in. Interested parties contact the Federation in order to start a club at their school. Registration gets the club access to national events. "This is an educational program designed to introduce students to fishing and to show students the ever increasing career and educational opportunities through fishing. It also shows students how the basic elements of their education are used by tournament anglers every day out on the water and how you can use fishing and having fun to sharpen those basic skills that will help you later in life no matter what your career choice." Members can compete in tournaments throughout the year, which prepare them for their individual state championships. If they are able to get through the state championships, they move on to Regionals. The final stage is the High School Fishing World Finals in the summer. High School bass fishing photo courtesy of Bassmaster and Protect the Harvest. 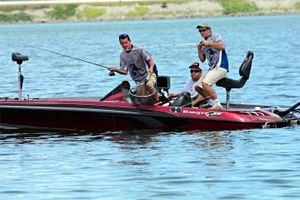 Bassmaster has also joined in on the national high school fishing arena. Their program is relatively new. B.A.S.S., as it's called, is a series that includes several opens for high school clubs and a national championship which was held for the first time in 2014. Multiple states' high school athletic associations recognize bass fishing as an official activity, including Missouri's State High School Activities Association (MHSAA) and Illinois' High School Association (IHSA), who have been the leaders in this movement. These states do an excellent job of promoting this sport alongside all the other sports. These organizations help prepare young anglers for futures in the sport. Colleges have even begun offering scholarships to high schoolers who compete in these events. Collegiate fishing programs have surged in the last 5-10 years and they look for the top talent to fill spots on their teams. Bethel University in McKenzie, Tennessee was the first university to offer scholarships for a fishing program back in 2010. There are currently over 300 colleges with fishing clubs and that number is expected to double in the coming years with a couple hundred more club teams in the planning stages. Several of these universities offer scholarships, but many don't need to because their athletes earn other financial awards. Because these teams are not directly involved with the NCAA, they are allowed to have professional sponsors and win money in tournaments. Bass fishing is the only collegiate sport that allows its competitors to do this, and it has been extremely beneficial to them. The sport continues to expand as collegiate and professional anglers see greater success and bring nationwide visibility to competitive fishing. Many involved on the high school or collegiate levels point out that the ultimate goal of this program, much like other amateur sports, is to educate young people about life, develop skills that will benefit them in any industry they join, and give them the chance to further their opportunities. It is certainly an exciting sport and we congratulate those who have played a role in helping it gain national attention on a number of stages as more Americans learn about its benefits. To learn more about these high school programs and how you or someone you know can get involved, visit highschoolfishing.org or bassmaster.com/high-school. The post A Competition Under The Surface appeared first on Protect the Harvest, and is reprinted with permission.